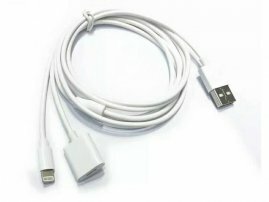 6 feet USB to Lightning Male and Lightning Female for Charging iPhone / iPad / iPad Pro Apple Pencil [POD005824] : Onchee.com - the accessory shop for all your handheld Electronics! Dual head, connect the lightning adapter to your apple device and connect the USB side into a wall adapter or USB hub to charge or your computer to sync data, directly connect the female lightning Adapter to your apple pencil, let your iPad pro pencil be charged without the original tiny adapter. - Charging cable for your Apple devices: iPad, iPhone, iPod. - This is not good for connecting between device for syncing data.